A fascinating look at the top women at Berkshire Hathaway and how they got there. Although proportionally women continue to lag far behind men as CEOs and board members at major institutions, there has been a marked uptick in the number of female business leaders in recent years. Looking at the changes that have happened at Berkshire Hathaway--Warren Buffett's holding company, The Women of Berkshire Hathaway: Lessons from Warren Buffett's Female CEOs and Directors provides a unique look at the gradual shattering of the glass ceiling at one of America's top firms. An influx of female leadership over the past few years--today there are four female CEOs, up from just one a decade ago--has invigorated Berkshire Hathaway with energy and unique female insight. Profiling these remarkable women, the book provides motivational and management information for a wide range of readers, from business students to Buffett fans. The only book focusing on eight of the most powerful women at Berkshire Hathaway, The Women of Berkshire Hathaway is an inspirational read about the triumph of a group of remarkable women within a company once dominated by men. ©2012 Karen Linder (P)2012 Audible, Inc.
Warren Buffett, Chairman and CEO of Berkshire-Hathaway, told Facebook's Sheryl Sandberg (Lean In: Women, Work and the Will to Lead, 2013) that his unparalleled success was easier because he didn't have to compete with half of society (women). 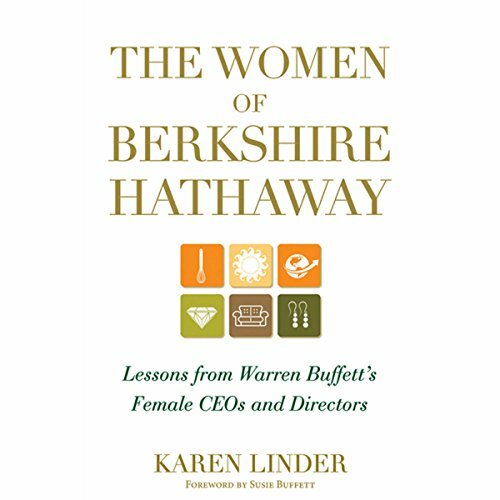 Buffet is a strong supporter and mentor of women executives, so I really looked forward to listening to Karen Linder's "The Women of Berkshire Hathaway: Lessons from Warren Buffett's Female CEOs and Directors" (2012). I wasn't expecting a book with the impact for women of the later published "Lean In," but I was expecting some good discussions of executive management techniques; problem solving tactics; management strategy; and a discussion of how Berkshire-Hathaway's women faced and overcame those challenges, especially those unique to women. Unfortunately, "The Women of Berkshire-Hathaway," for the most part, didn't do this. Long sections of the book read/sounded like a laudatory corporate biography from a website. I didn't even start to get engaged with the book until Chapter 7, which is about Beryl Raff of Helzberg Diamonds. Raff has had some interesting career moves, not all her choice - but there's no back story about what happened. The only women to acknowledge any unique obstacles they overcame as women executives are board members Charlotte Guyman and Cathy Baron-Tamraz, CEO of Businesswire. The "lessons" in the book were pretty much trite business adages like "Find your passion," and "Know your market," and "Communicate with your team." Being friends with Warren Buffett helps, too - although to be perfectly clear: these women are where they are because of sheer, fierce competence. The book seriously needed a text edit and an audio edit. I gave up counting the number of times the author repeated how difficult the audit committee of a Board of Directors is. And the narration - well, Vanessa Hart has a nice voice, but there's no 'urbane' in Urbana-Champaign; it's 'Sarbannes-Oxley', not 'Sarbannes-Oakley' (although it was amusing to imagine the Act as print framed sunglasses); there's no 'k' sound in nascent . . . And so much more. I'm a fan of the Oracle of Omaha and I'm intrigued by these women leaders but the book wasn't what I hoped for. On other hand, if you want to work for one of these women (or you are a Pampered Chef consultan) it's definitely worth the read/listen.